I just returned yesterday from my first visit to Haiti as one of a group of 16 graduate students in public health, forestry and environmental studies, and nursing. Our route took us from Port au Prince, the capitol city devastated by a magnitude 7.0 earthquake in January 2010, through the Artibonite Valley, the epicenter of the subsequent cholera outbreak, and finally to the city of Hinche in the Central Plateau, the site of a suspected sewage dump that set off an epidemic that has killed thousands. We spent a week in the town of Deschapelles, located in the Artibonite Valley about 70 miles north of Port au Prince. Our group stayed at an inn run by a member of the founding family of Hopital Albert Schweitzer. At each meal, we received heaping helpings of multiple varieties of starch - rice and beans, fried plantains, fried potatoes, and bread - a common cuisine in many areas located in the tropics. With a paper-white, dense, dry crumb and a hard, smooth tan exterior, this bread can't disguise its lack of nutritional value. Unless slathered in butter, it has no flavor at all. Even when fresh, it has a stale, crumbly quality. The dough is probably made from a low-protein, low-quality flour, minimally hydrated and leavened as quickly as possible. A 10-mile hike from Deshapelles, through a set of mountains, and to the next valley brough us to Bastien, a small town known in the local area for small, round, spongy boules of bread. Our guide called it "mountain bread," though I'm not sure what the proper name is. We saw a beehive-shaped clay oven next to one of the homes nearby. In Bastien, we also met a lady selling fry bread. The flavor resembled that of a salty, unsweetened donut. We asked her how she made her bread, and she mentioned flour, water and salt. It seemed to be chemically leavened. I asked her in my horrible kreyol, "eske mwen kapab pran foto ou?" - May I take a photo of you - and she was happy to oblige, proudly posing for a shot with her product. Having hiked 5 miles of winding, hilly trails under the hot sun, we were quite hungry (in the first-world kind of way), and the sensation of fat and salt on our palates gave us a euphoric rush. I can only imagine what it must be like to eat a hunk of fried dough when you're truly hungry. Ironically, diabetes and hypertension are on the rise in the Artibonite Valley in the midst of malnutrition. It seems to be an emerging trend in many developing areas - disease of excess right alongside diseases of deprivation. It's difficult to avoid starchy, high-fat, high-sodium foods when they are the most affordable and available. We're familiar with the same patterns here in the United States. It somehow seems fitting that the bread in a place with such a complicated past and an equally complicated present should be so simple; it's a basic food that allows people to fill their bellies and go on with their lives. Spending time in an impoverished area always reminds me what a privilege it is to be able to choose what I eat, and to turn down the things I don't want to eat. It is also a privilege to have had the education to make knowledgeable dietary decisions, and to never have been forced to decide between going to school or eating dinner. For those of you who were lucky enough to have a spring break, I hope it was enjoyable, and I look forward to hearing about your adventures. Just after the new year, I had a delicious pan con tomate served on pan de cristal at a tapas restaurant. I wanted to give this bread a shot at home. Its properties are unique - the crust is shatteringly thin, and the crumb is so airy it barely exists at all. Prior to serving, it is toasted until crispy. Though its structure resembles that of a rustic ciabatta, it is not chewy but light and crisp. After consulting this extensive post on TFL, I decided to use Hamelman's ciabatta with stiff biga formula , increasing the hydration to 80% and beating the slack dough with the paddle attachment until the smooth windowpane stage. I elected to use the stiff biga version instead of the poolish version of ciabatta because I thought that the extra protease activity would be counterproductive to creating the lofty structure of an already-slack dough. The loaves took almost an hour to brown at 460 F. I flipped them over twenty minutes into the bake to get a more even crust on both sides. One of the longer, wider loaves tried to escape from my flipping board and ended up deformed. I would have liked more browning, but I was concerned that the crust would become too thick and hard. The crust was too hard and thick, which is made worse by toasting. Let's just say that my molars are well-polished. I wonder whether it would be better not to flip the loaves during the bake, and to simply cut off and discard the thick bottom crust that contacts the baking stone prior to serving. It is also possible that there was not enough steam in the oven. I might also try increasing the baking temperature to 500 and shaping thinner loaves so that they bake more quickly. the crumb was not open enough. I think the intensive mix may have contributed to this. Next time, I might try more stretching and folding, combined with a slightly lower hydration - perhaps 75%. The flavor was quite bland. The reluctant browning was the first hint that the loaves would turn out this way. Nonetheless, we enjoyed the bread with roasted bone marrow, piquillo peppers and manchego cheese. It's surprising how difficult it is to find authoritative information about pan de cristal online. If any TFLers have inside information about how to reproduce it, please do share! Not much substance in this post. I got a new 8 inch brioche mold in the mail and decided to make a gigantic brioche a tete, along with two small ones. The photo below is kind of cute because it looks like the big brioche is cuddling against the little brioche. Please excuse the obvious technical flaws. The tete was too large - it's 200 grams of dough vs. 400 grams for the body. Next time I'll scale it down to 150 for the tete and 450 for the body. Anyway, I hope you enjoy this entirely inconsequential photo! Every year, we spend Thanksgiving in Palm Springs, California with my boyfriend's parents. The weather there is warm and there are many blue, cloudless days to enjoy. We decided to do an alternative Thanksgiving dinner this year without turkey, cranberries, pumpkin pie, or any of the usual fixings. Instead, we had a nice rib roast, which coasted to 120 degrees F slowly inside a 200 degree oven. Instead of dinner rolls, I opted to make epis using Hamelman's baguettes with pate fermentee formula. The dough was divided into three 500 gram pieces, which resulted in three very fat baguettes, as they had to fit onto a half size sheet pan. While the kitchen is quite spacious, my boyfriend's parents aren't bakers, so I had to do without a bench scraper or a baking stone - in the grand scheme of things, only a minor inconvenience. For dessert, I made some apple cinnamon rolls with Glezer's Baking Team USA Sweet Dough formula. Instead of spreading butter on the rolled out rectangle of dough, I used a thick layer of apple butter and sprinkled cinnamon sugar on top. The result tastes like apple pie in cinnamon roll form. I highly recommend it. Plus, you can justify eating more than one if you tell yourself that this is a lower-fat version that cuts down on the butter content. Here are the almost-proofed rolls. It took almost seven hours to fully rise. After coming out of the oven, they were drizzled with some maple glaze: a couple tablespoons of maple syrup, powdered sugar, and cream. This'll feed us for breakfast for a couple more mornings. I hope all of you had wonderful Thanksgivings. I look forward to seeing everyone's holiday baking in the coming month. 1. Last time: the dough was mixed for too long and got too developed. This made it impossible to roll out the layers. It was like wrestling with a rubber band. Not only did this make the process hard on the arms, it also resulted in thicker, doughier layers because the dough could not relax enough to be rolled out thinly. This time: I mixed the dough until uniform and gluten formation had barely begun. As Ciril Hitz says in Baking Artisan Bread, gluten development should happen in the course of being rolled out (stretched) during the lamination steps. There is no need to fully develop the gluten in the beginning. 2. Last time: The butter layer shattered into several small pieces instead of spreading out uniformly, due to being too cold. A number of authors advise you to freeze the dough between lamination steps for about 20-30 minutes, arguing that this will make the butter and dough the right consistency to roll out. This time: I just used the fridge instead of the freezer. I used Kerrygold butter, which has fat content equivalent to typical European butters, so at 38 degrees, it is stiff yet pliable. I guess this depends on how cold your freezer is. Mine is kept at a frosty -2 Fahrenheit. 3. Last time: Croissants were underproofed, so the butter leaked out very badly during baking. This time: I proofed until the croissants were "jiggly" and very puffy. While there was still a tiny bit of butter meltage, it was not nearly as bad as last time. The crust was so light and the crumb was so tender that they started shattering under the slight pressure of my fingers while being transferred to the cooling rack. The croissants are shatteringly crisp on the outside and moist and light on the inside. The crumb shreds into transparent sheets. I highly recommend the Weekend Bakery tutorial. I've frozen half the batch, so it'll be interesting to see whether this affects the taste and texture. Happy Sunday, everyone! Over the weekend, I finally worked up the courage to try making Bruno's Pandoro from Maggie Glezer's Artisan Baking. I followed the the formula almost exactly. The one thing I changed was to replace all of the whole eggs in the formula with an equal amount of egg yolks by weight. I had the idea in my mind that this would give the final product better color and flavor (more on this later). Though time consuming, the process was much easier than I anticipated. The dough wasn't entirely successful. As you can see in the photo below, there were little coagulated chunks that never broke up. I'm guessing they came from the step where I added flour and egg yolk to the first dough. The egg yolk bound with the dry flour to form little chunks that couldn't be dispersed by mixing. In retrospect, I should have filled the molds just a tad more to get that big pillowy base that pandoro should have. Given the limited amount of oven spring, it was the correct decision to bake when I did, or the loaves would have collapsed. I had to decrease the oven temperature from recommended 350 F to 325 F about twenty minutes into the bake because the tops were getting too dark. I wasn't too happy about the crumb, which had a spongy cake-like texture. I'm looking for a pillowy soft bread-like texture with shreddable strands. I'm not sure how much of this shortcoming is attributed to the amount of egg yolk I used, and how much is attributed to adding the butter/cocoa butter to the mix too rapidly or too soon. The uneven chunks indeed proved to be unpleasant in texture. The egg yolk flavor turned out to be too strong and gave the bread a "gamey" flavor, if that makes any sense. Next time, I'd like to make the loaf a little sweeter, use whole eggs just as the formula prescribes, increase the vanilla, and perhaps increase the proportion of cocoa butter, which I would like to stand out more in the flavor profile. Despite the pandoro not being perfect this time around, it still makes for a great breakfast (smeared with nutella), and it was a lot of fun to work with the silky, runny dough. This is my version of something I ate growing up. I’m pretty sure it’s forbidden by Atkins, South Beach, and every other well-known diet, but sometimes you need food to feed the soul. ~AP flour will work if you don't have bread flour, though bread flour provides some additional strength and chew. High gluten flour is not ideal, because the finished dough won't be extensible enough to be rolled out thin in one of the later steps. ~You can decrease the amount of salt according to your own tastes and/or dietary needs. Salt is not necessary. ~If you don't like the flavor of sesame oil, you can replace it with vegetable oil. It's in the formula to make the finished product a little more tender. 1. Combine all the ingredients at once and mix/knead for a minute or two until you have a uniform but still shaggy ball of dough. All of the flour should be hydrated. In Peter Reinhart parlance, the dough should be "tacky but not sticky"
2. Allow the dough to rest for 15 minutes, and then knead for a minute by hand. After kneading, give the dough another 15 minute rest, followed by another minute of kneading. You can repeat the resting and kneading procedure as many times as it will take to get a very smooth, satiny dough. It took me three kneading sessions in all, including the initial kneading in step 1. Below, you can see how the dough develops. Just after step 1, the dough is still shaggy, and you can see a lot of tears on the surface due to lack of gluten development. After the first resting and kneading step, the dough is smoother, although not yet perfectly smooth (above, left). The tears on the surface have decreased but are still there. After the final resting and kneading step, the dough has no tears on the surface and is perfectly uniform. Set the scallion aside for later. 3. Weigh the dough, and divide into 5 equal pieces by weight. They should be around 100 g each, probably a bit heavier. 4. Shape each piece into smooth ball, as if you're making dinner rolls, and let rest for 10 minutes. 5. Roll each ball into a flat pancake. Go as far as the dough will allow you. Let these intermediate pancakes rest for about 10 minutes. Use bench flour to prevent the dough from sticking to the board. 6. After resting, roll the dough out again. The goal is to get a sheet of dough that's less than 1/16 of an inch thick. You should be able to see your fingers through it, but it should not be so gossamer thin that it breaks easily. I usually finish this step by picking the dough up and draping it over my knuckles and tossing it a bit to let gravity stretch it. 7. Lay the sheet flat on a large surface. Pour as much oil onto the sheet as it will take to cover every square inch with a thin layer (as I said, this is not a low-fat recipe). Gently fold in corners of the dough to help spread the oil around. 8. Sprinkle a handful of chopped scallion on the sheet, and roll the sheet up gently but somewhat tightly into a big cigar. Try to squeeze out the air as you roll. 9. Pinch the ends to seal, then coil the cigar and flatten by pressing down with your palm. Coat the flattened coils generously in oil, and them rest for yet another 10 minutes. The photo below shows how the coil should look before flattening. 11. Now you're ready to cook them (finally). Use the sheet of plastic wrap to flip the pancakes onto your stretched palm and then onto a frying pan on medium heat. They're so flimsy that they’ll deform under their own weight if you don’t support them this way. Since the pancakes were already coated in oil in step 9, you should not have to put any oil in the pan. You can reuse the same sheet of plastic for all the pancakes. Once both sides are toasted, the insides should be done as well, since the pancake is so thin. You’ll smell sauteed scallion in the air. Once they're cool enough to handle, cut them into wedges and enjoy. You can eat them plain, with your favorite spread (mine is japanese mayo with sriracha and lime), or filled with whatever you want (I had them with barbecued pork). For a breakfast of champions, roll up a couple of fried eggs in a whole pancake for a variation on the "Rolex," a “chapati burrito” with egg that I ate while I was in Uganda for a month. -would the blueberry flavor be concentrated enough from just fresh blueberries? -would I be able to knead whole berries into the dough, or would I have to find some other method of incorporation? -how should I adapt my usual go-to bagel formula? On the first point, I decided I would go ahead with the experiment and find out by tasting the product. Regarding the second point, in all my online research, I'd never seen a blueberry bagel with fresh whole berries kneaded in (they would probably explode and leave a mess), which led me to the decision that I would cook the berries down into a sauce, puree the sauce, and strain it to yield a smooth liquid, which I would use to replace part of the liquid in the formula. Below on the left is the blueberry sauce after cooking. On the right is the strained blueberry puree diluted with water (how much water? see below). Finally, to my third initial question: how to adapt the formula to account for solid matter in the blueberry puree? First, I decided to use SAF Gold label osmotolerant yeast instead of regular instant yeast in case the amount of sugar in the puree was too high. I use Peter Reinhart's bagel formula in the bread baker's apprentice, which is about 57% hydration. Not knowing what percentage of the blueberry puree was water, I wasn't sure how to adjust the amount of liquid, so I played it by ear. I just estimated that there would have to be 2 extra ounces of water than the formula calls for to compensate for the blueberry. I planned to adjust the flour later, if necessary, depending on how the dough felt. The sponge was allowed to ferment until doubled in bulk, which took about 4 hours. Immediately after kneading to the windowpane stage, as Mr. Reinhart instructs, I divided the dough into 4 oz pieces and shaped them into rounds. The rounds were allowed to rest for 10 minutes. Afterward, I rolled each one out into a flat somewhat rectangular sheet and rolled them up tightly into logs. After another ten minutes of resting under damp paper towels (the dough dried up on the surface very quickly without them), I extended the logs into long snakes, looped them around my fingers, and rolled the overlapping ends to seal the bagel into the "O" shape. I found that for the best result, the overlapping area should span at least the width of your four fingers. I had to supplement this rolling method with some pinching to seal the ends securely. Once the solution came up to a gentle boil (more than a simmer but less than a rolling, witches' brew boil) I popped the bagels in for 2 minutes per side. I should have expected this, but I was surprised to find that some chemical reaction between the baking soda solution and the blueberries caused the purple bagels to turn almost black! Below you can see the contrast between the boiled bagels and the unboiled ones. I was hoping that the baking soda was indeed the reason behind the color change, and that the inside would stay pleasantly purple. After baking for about 15 minutes, with a couple rotations of the sheet pans for evenness of browning, they came out dark greyish purplish brownish black (maybe there's a name for this shade in the Sherwin-Williams catalogue?). When I sliced them open, I was relieved to find that the lovely purple color had not disappeared entirely. The crusts actually provided a nice contrast to the interior color. Back to the first initial question: was there enough blueberry flavor? I wouldn't say the flavor was overtly of blueberry. The dough had a gentle sweetness and a definite blueberry fragrance, but the sensation of the fruit was mostly olfactory. After savoring a bite for a little bit, the blueberry begins to come through. The floral nature of the fruit complements the malt flavor of the bagel nicely. They're delicious with some fruity cream cheese. The crust color was at first discouraging, but now I kind of like the idea of slicing one open to find a bright surprise on the inside. Now that summer's almost here, really nice berries are popping up at the market. Last week, I bought two large boxes of strawberries, and a large box each of blueberries and raspberries. I did a decent job eating them, but they were starting to go overripe, so I decided to make a summer berry pudding. It's one of my favorite easy desserts because there's not much precision required. The recipe is pretty foolproof, and you can substitute any berries you like. The only requirement is that you have some good bread and enough berries to make plenty of sauce. The technique involved is minimal. To prepare the berries, I sliced the strawberries into 1/4 thick pieces, sliced the raspberries in half, and left the blueberries whole. I sprinkled enough sugar on them to suit my personal sweetness preference, and added a couple tablespoons of raspberry liqueur (optional, but never add too much of it. It overpowers the berries). I allowed the mixture to macerate in the fridge overnight, which should draw out a good amount of liquid. If you like to have some whole berries in the pudding, reserve a generous handful of each of the fruits and store them separately. The second day, I brought the macerated mixture up to a boil and adjusted the flavor with sugar and some lemon juice. The mixture boiled until the berries softened and fell apart. Toward the end of the cooking time, I added the reserved berries. I cooked them just until they started to soften, and took them off the heat immediately after so that they would stay intact in the final product. For the bread, I made Peter Reinhart's BBA poor man's brioche. You could use an even richer bread, but I'm not sure the extra fat would make this fruit-based dessert much better. My 3.5 quart round dutch oven was the closest cross sectional size I could get the small circular mold I used to assemble the pudding. 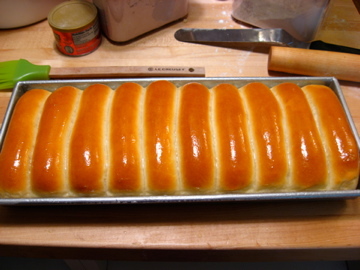 The brioche sprang up nicely. It came out looking like a giant muffin. I sliced the megamuffin into five round layers and used the bottom of the mold as a guide to trim the rounds to the right size. The trimmings were perfect for a small savory bread pudding. Then came the fun part: layering. No rocket science here. Just a layer of bread, a generous layer of the berry liquid (at least enough to soak the layer of bread underneath through), followed by bread, and then berries, etc. I suggest erring on the side of generosity. Too moist is better than too dry. 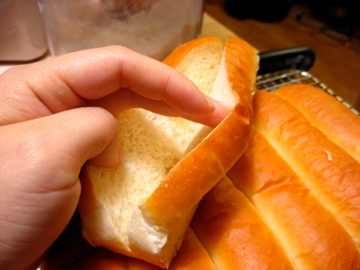 The top layer should be the last piece of bread, with just liquid spooned on top. You can have some berries on top if you'd like, but they make the next step more difficult. You can see the circular mold I used in the left hand background. This summer berry pudding may not the prettiest or the most refined thing in the world, but it bursts with berry flavor and tastes like summer. All it needs is a dollop of whipped cream (and perhaps a scoop of vanilla ice cream if you're feeling indulgent). After having delicious lobster rolls with New England style buns at RM seafood in Las Vegas, I became obsessed with soft, toasty rolls with just the right amount of crunch. I decided to buy a New England hot dog bun pan (of course, the buns can be made with an ordinary sheet pan, but I just felt like purchasing a unique piece of equipment). Here they are, fully risen and just placed into the oven. A 3/4 recipe makes a pretty good amount of dough for the size of pan. The proper amount of kneading will allow this dough to triple, almost quadruple in size. 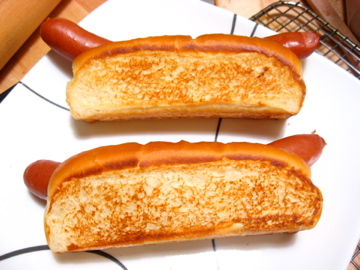 The crunchiness of the toasted surface went perfectly with the snap of the natural casing hot dog. The king arthur recipe is very rich, buttery, and sweet. I love how these buns stand up so straight:-). I'm pleased with how this pan makes a bun that's not too big and not too small. 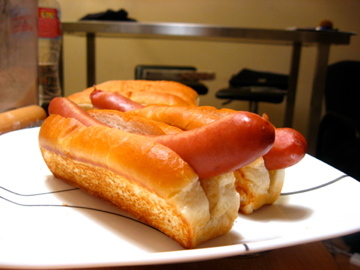 One of my pet peeves is a hot dog that's drowning in a mountain of bread. Personally, I'm addicted to the toastiness of the New England style roll. I don't think I'll go back to regular soft hot dog buns. Was it worth the $25 to buy this special "unitasker?" I would say yes, but I just wanted a new toy. I'm thinking of it as a pre-moving gift to myself, before I make the great schlep from San Francisco to New Haven, CT. Maybe there are other uses for it, too. Enchiladas? There are 2 of us in this household, so the 10 buns give us enough for dinner and plenty for leftovers tomorrow. I'll probably use the remaining 6 buns to use up the leftover chicken meatballs in marinara and the leftover Italian sausage.